So, finally got this working!!! And I wanted to get it to run on Linux, so here's the sequence of steps I followed. Do not plug in the modem. Type the command cd /etc/usb_modeswitch.d and press enter. Type sudo gedit and press enter. Enter your ubuntu password when asked and press enter. When the text editor opens up, copy paste the following into it. Save the file as "201e:2009" (Yes that's the filename - a pair of 4 digit hexadecimal numbers seperated by colon). In the terminal window, type the command sudo gedit /lib/udev/rules.d/40-usb_modeswitch.rules and press enter. Enter your ubuntu password when/if asked. Text editor will open the file "40-usb_modeswitch.rules". Browse to the end of the file till you reach the last line which says LABEL="modeswitch_rules_end"
Insert a few lines by pressing enter before this last line. Right click the network icon next to the clock and select "Edit Connections". Navigate to the "Mobile Broadband" tab. Click "Add Connection". Your Modem will be listed there as "Qualcomm CDMA Technologies MSM". Select provider as "Tata Indicom (Photon+)" and press forward. In the yet open "Network Connections" window, select "Tata Indicom (Photon+)" and click the "Edit" button. In the "Username" field, type "internet". In the "Password" field, type "internet". Close the "Network Connections" window. Left click the network icon next to the clock and from the menu that appears, select "Tata Indicom (Photon+)". Wait for your computer to connect to the internet and then start browsing away to glory. To disconnect, repeat step 32. Next time, you will just have to plug in your modem, wait for a few seconds for the "Tata Indicom (Photon+)" show up when you left click the network icon next to the clock and then click on it to connect again. 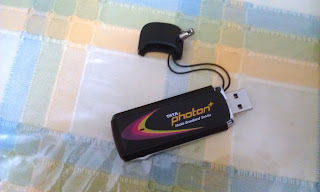 The Tata Photon+ modem has a ZeroCD feature which allows the device to act as a CDROM drive containing its own drivers and application installation files. This CDROM mode is the default mode when the device is plugged in to your USB. To use the device as a modem, we need to force it to switch modem - a task which is achieved on Microsoft Windows by the drivers which are installed from the virtual CDROM drive. On Ubuntu, editing the "40-usb_modeswitch.rules" in steps 9 thru 15 above helps automate the task of the forcing the Tata Photon+ USB device to switch from mass storage mode (acting as a CDROM drive) to modem mode. If "40-usb_modeswitch.rules" is not edited, one would have to execute the command sudo usb_modeswitch -c /etc/usb_modeswitch.d/201e\:2009 everytime the Tata Photon+ device is plugged in. Step 17 - restarting your computer: may not be necessary, but it doesn't hurt anyway. Step 19 - It takes a few seconds for the modem to boot up and for the computer to force it to change modes and be recognised by the Network Manager as a modem. Tata Photon+ distributed many different versions of it USB Modem devices. The above post is only applicable for the ones marked "V-ME101"
or better still, the newer versions of ubuntu will do the above things for you automatically!